Before I start, I just want to clarify where and what Snow White came from and how it came to be. I was sitting at work one day talking to buddies and I would always refer to my STI as the “STEE” – basically “STI” pronounced. I wanted a name so that I could label it and then just let it roll from there. The only person I could think of that could possibly be witty and creative enough with thinking of a name was JC. It took him all but a few minutes before he thought of things. First one was White Chick – which I thought was pretty awesome, but could be mistaken as racist or my actual girlfriend. LOL. 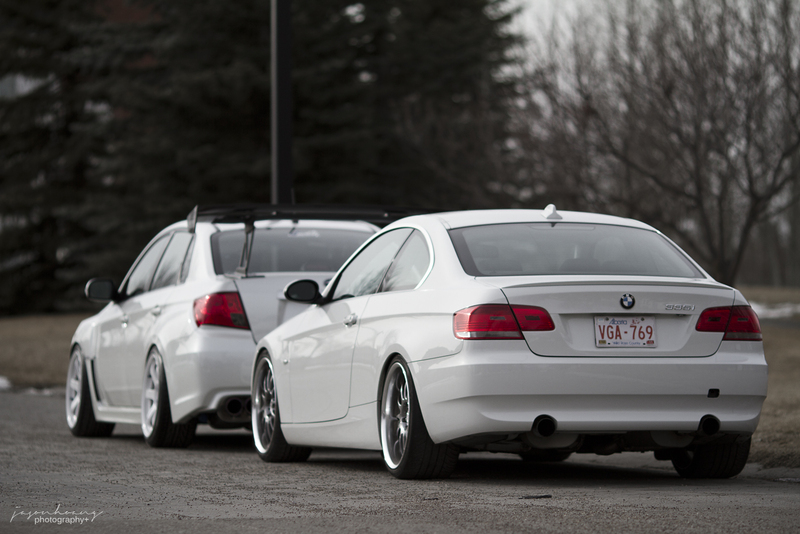 So he came up with Snow White – fitting, because it suits the aesthetics of the car – all white everything. From that day forward, we’ve been referring to my STI as Snow White everywhere – twitter, instagram, in person… and it’s gotten to stick! hahaha who would’ve thought. Anyways onto the better half of this post… after yesterdays’ install, I wanted to drive it so bad, you couldn’t even imagine. 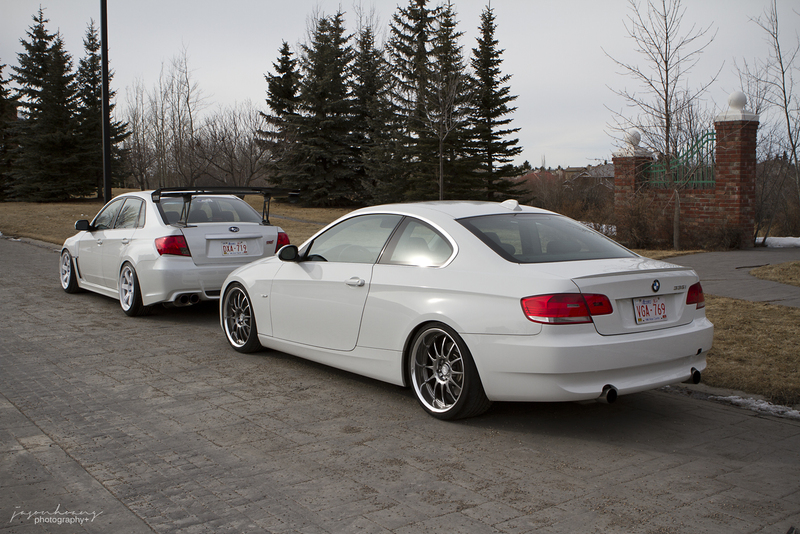 All day at work today, I kept watching videos of the car starting up, driving away, and of pictures just parked there. I decided that when I got home I was gonna drive it for a bit – I needed to. So I post it on twitter and Almond messages me saying he’ll meet me. Hell yes. So we meet at Co-op gas station and ride around till we find a decent enough spot with as little gravel and snow as possible. We ended up in some estate-looking area and took quick pics. 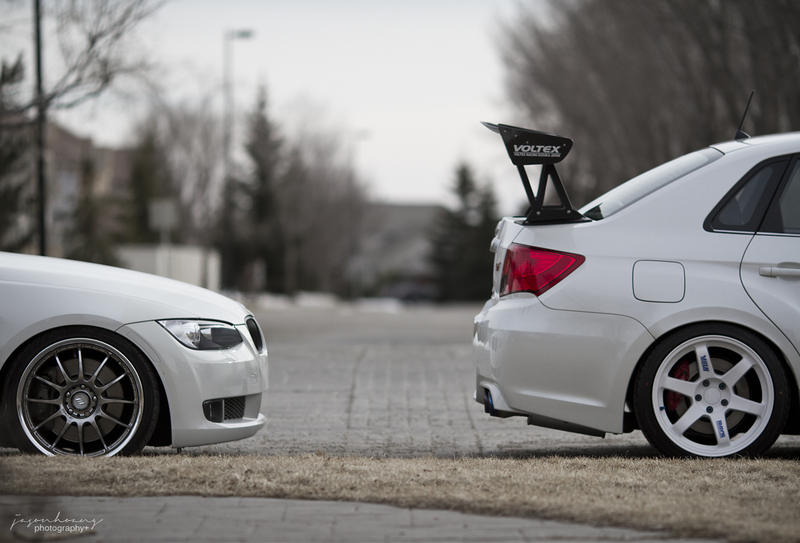 Almond’s 3-series is still looking as fresh as the day we shot it last year for illmotion. 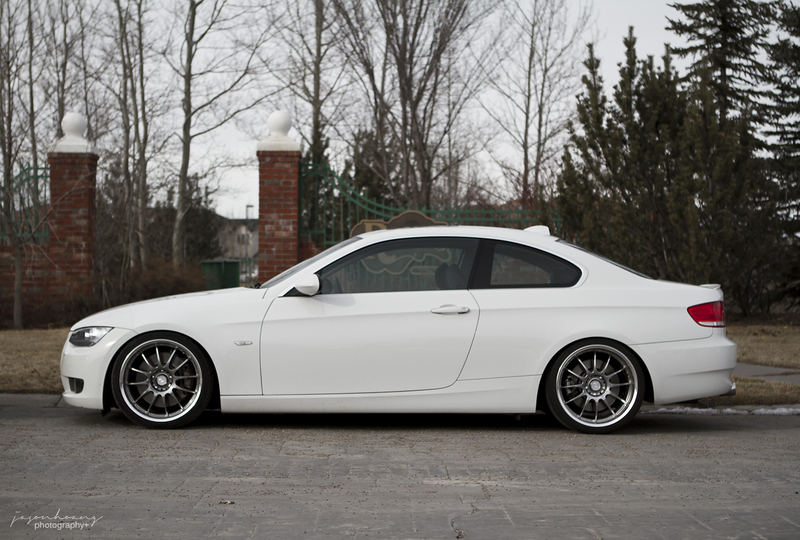 So clean and the wheels… Love. The two looked so good together. The white, the chrome, the carbon. Awesome. My first profile shot of the almost-completed look. So far so good. The red Brembos make a huge difference. 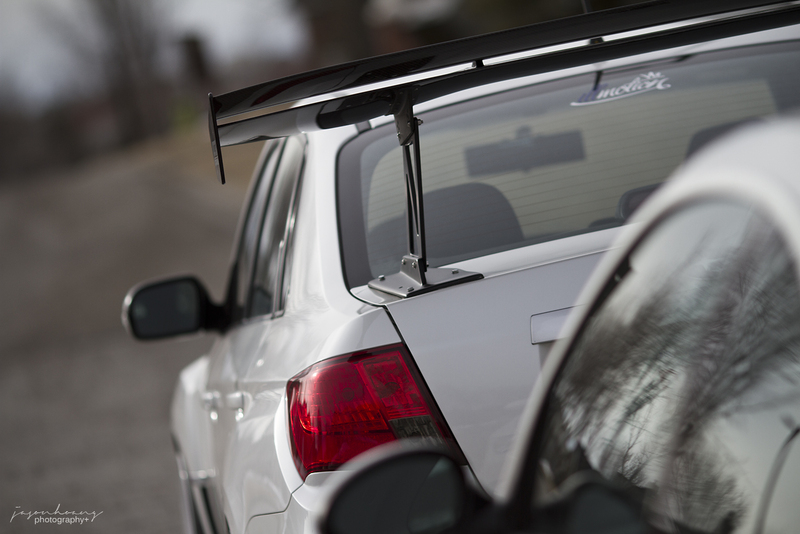 Hey i was wondering what kind of wing that is thats on the subie? 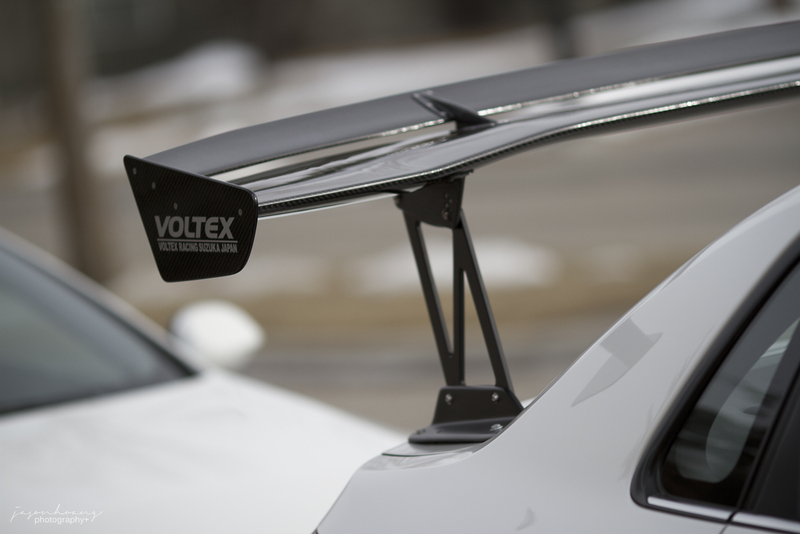 I know its Voltex but i was wondering if it was 1700?